The perfect foundation for any outfit starts with the items underneath it. The comfort of a cotton undershirt. The relaxed fit of a fun-designed boxer. The softness of classic pair of socks. These are all items that help start my son's school day on the right note. And he owes it all to Hanes. Hanes has been around for ages — since 1901, to be exact! They solidify the meaning of comfort. My son's drawer is filled with their classic t-shirts, socks and boxers. Hanes products have been a staple in my family's life for years. To make this brand even more wonderful than it already is, Hanes product packages now include Box Tops for Education on them. So, when you purchase certain underwear, socks and tees, the package will include a gift for your child's school. It's like being paid to shop! We all know how important it is to support our local schools and communities in their fundraising efforts. How cool is it that Hanes is making it simple to give back just by purchasing items that are already on your back-to-school lists? If the items above have you jumping for joy, wait until I tell you what else is included in this great giveaway. 100 Box Tops for your child’s school. Count 'em...10, 50, 100 Box Tops. If you do the math, that is $10 for your child's school. We're talking free money, people. Because I know how scarce time can be now that school is back in session, I will try to make entering as simple as possible. 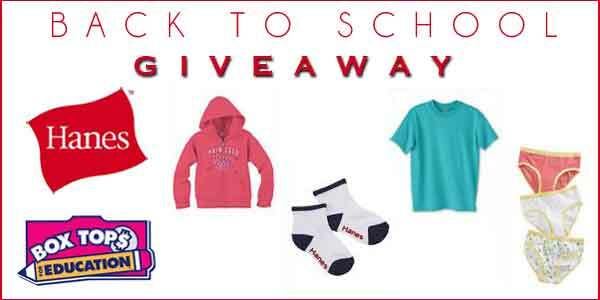 Don't forget to choose Hanes brand products when ordering t-shirts, polo shirts and sweatshirts for your school. Your school can earn Box Tops for these purchases as well. Hanes sent me a few of their items. There was no monetary compensation for writing this post. I am a member of the Box Tops for Education Panel so I am happy to promote this great giveaway. The opinions and views are my own.